The name is recorded in 1166 as Blachehedfeld and means the "dark coloured heathland". It is formed from the Old English 'blæc' and 'hǣth' and refers to the open space that was the meeting place of the ancient hundred of Blackheath. The name was later applied to the Victorian suburb that developed in the 19th century and was extended to the areas known as Blackheath Park and Blackheath Vale. An urban myth is that Blackheath was associated with the 1665 Plague or the Black Death of the mid-14th century. The idea that Blackheath got its name from its use as a burial pit goes all the way back to the medieval period, when it was almost certainly used for the disposal of the dead during the ‘Black Death‘. Virtually every part of London has a local tradition about plague pits under, say, a local school or shop. Certainly they were very common. The sheer number of bodies meant that the traditional churchyards became, as one contemporary put it, ‘overstuft’ very quickly. The Roman road that later became known as Watling Street crosses the northern edge of Blackheath (almost in line with the A2), probably heading for the mouth of Deptford Creek, rather than for Deptford Bridge like the modern A2. Blackheath was a rallying point for Wat Tyler's Peasants' Revolt of 1381, and for Jack Cade's Kentish rebellion in 1450. Wat Tyler is remembered by Wat Tyler Road on the heath. After pitching camp on Blackheath, Cornish rebels were defeated in the Battle of Deptford Bridge (sometimes called the Battle of Blackheath), just to the west, on 17 June 1497. With Watling Street carrying stagecoaches across the heath, en route to north Kent and the Channel ports, it was also a notorious haunt of highwaymen during the 17th and 18th centuries. As reported in Edward Walford's Old and New London (1878), "In past times it was planted with gibbets, on which the bleaching bones of men who had dared to ask for some extension of liberty, or who doubted the infallibility of kings, were left year after year to dangle in the wind." In 1909 Blackheath had a local branch of the London Society for Women's Suffrage. The Vanbrugh Pits are on the north-east part of the heath. The site of old gravel workings, Vanbrugh Pits have long been reclaimed by nature and form one of the more attractive parts of the generally rather flat Blackheath. It is particularly attractive in spring when the extensive gorse blossoms. The pits are named after Sir John Vanbrugh, architect of Blenheim Palace and Castle Howard, who had a house nearby, adjacent to Greenwich Park, now called Vanbrugh Castle. 'Mince Pie House' built for his family, survived until 1911. The sizeable estate of Blackheath Park, created on lands of Wricklemarsh Manor by Victorian houses – most notably Michael Searles' crescent of semi-detached terrace houses linked by colonnades, The Paragon (c 1793-1807) – as well as some 1930s and 1960s additions. The Cator Estate was built on part of the estate formerly owned by Sir John Morden, whose Morden College (1695) is another notable building to the south-east of the heath. The Cator Estate also contains innovative 1960s 'Span' houses and flats by the renowned Span Developments (architect Eric Lyons), and the Blackheath High School buildings on Vanburgh Park include the Church Army Chapel. 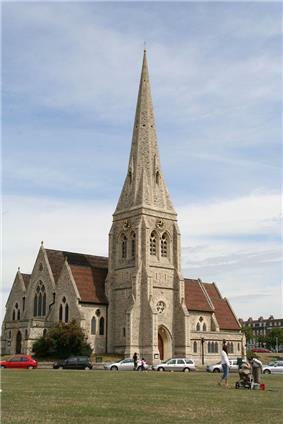 St Michael and All Angels Church, designed by local architect Benjamin Ferrey, dates from 1857. Another Anglican church, St John the Evangelist's, was designed in 1853 by Arthur Ashpitel. The Pagoda is a notable example of a beautiful property situated in Blackheath, built in 1760 by Sir William Chambers in the style of a traditional Chinese pagoda. It was later leased to the Prince Regent, who would become King George IV, and used as a summer home by his wife Caroline, Princess of Wales. In 1871 the management of Blackheath passed by Act of Parliament to the Metropolitan Board of Works. Unlike the commons of Hackney, Tooting Bec and Clapham, Blackheath came to the Metropolitan Board of Works at no expense, because the Earl of Dartmouth agreed to waive his manorial rights. It is held in trust for public benefit under the Metropolitan Commons Act of 1886. It passed to the London County Council in 1889, then to the Greater London Council. When the GLC closed in 1986, responsibility was given to the two boroughs of Greenwich and Lewisham, where it remains today. The heath itself is not common land, but manorial waste. The freehold is retained mostly by the Manor of Lewisham (owned by the Earl of Dartmouth) and also the Royal Manor of Greenwich (owned by the Crown Estate). The heath's chief natural resource is gravel, and the freeholders retain rights over its extraction. In 1608, according to tradition, Blackheath was the place where golf was introduced to England – the Royal Blackheath Golf Club (based in nearby Eltham since 1923) was one of the first golf associations established (1766) outside Scotland. Blackheath also gave its name to the first hockey club, established during the mid 19th century. However, Blackheath is perhaps most famous for founding the England and Scotland in Edinburgh on 27 March 1871) and hosted the first international between England and Wales ten years later – the players meeting and getting changed at the Princess of Wales public house. Blackheath was one of the 12 founding members of the Football Association in 1863, as well as nearby Blackheath Proprietary School and Percival House (Blackheath). Cricket used to be played on the 'Heath' from the 1820s. By 1890, London County Council was maintaining 36 pitches. Blackheath Cricket Club has been part of the sporting fabric of the area, joining forces with Blackheath Rugby Club in 1883 to purchase and develop the Rectory Field as a home ground in Charlton. Blackheath C. C. hosted 84 first class Kent County matches between 1887 and 1971. 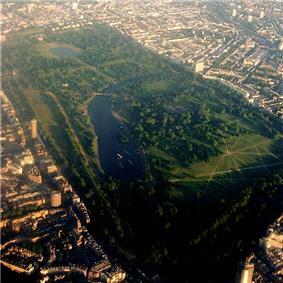 With neighbouring Greenwich Park, Blackheath has, since 1981, become well known as the start point of the London Marathon. This maintains a connection with athletics dating back to the establishment of the Blackheath Harriers (now Blackheath and Bromley Harriers Athletic Club) in 1869. One of the Marathon start routes runs past the entrance to Blackheath High School for Girls, home of Blackheath Fencing Club. There is also a long history of kite flying on the heath. Growing popularity of the sport in recent years has attracted many kite flyers and kitebuggying has also appeared on the heath. British Military Fitness runs its evening classes on the heath during the winter months, when Greenwich Park is closed. Blackheath is one of the largest areas of common land in Greater London, with 85.58 hectares (211.5 acres) of protected commons. The heath is jointly managed by Lewisham and Greenwich councils, with the area south of the A2 being under the management of Lewisham. Highlights on the Greenwich side include the Long Pond (also known as Folly Pond), located close to the entrance of Greenwich Park. On the Lewisham side, there are three ponds, with Hare and Billet pond considered to be the most natural and probably the best wildlife habitat. Lewisham retains important areas of acid grassland that support locally rare wild plants such as Common stork's bill, Fiddle dock and Spotted medick. Key areas are to the east of Granville Park between South Row and Morden Row and on the cricket field east of Golfers Road. Blackheath's heathland habitat was well known to early botanists – in the 18th century Carl Linnaeus is reported to have fallen to his knees to thank God when he first saw the gorse growing there. This environment supported both the flora and fauna of wild grassland. In 1859, Greenwich Natural History Society recorded a wide list of animal species, including natterjack toads, hares, common lizards, bats, quail, ring ouzel and nightingale. Today, bats are still found on Blackheath and migrating ring ouzel may occasionally be seen in spring. The biggest change to Blackheath resulted from extensive mineral extraction in the 18th and early 19th centuries, when gravel, sand and chalk were extracted. This left large pits on many parts of the heath. In 1945, pits were filled in with bomb rubble from World War II, then covered with topsoil and seeded with rye grass, leaving only Vanbrugh Pits to the north-east side and Eliot Pits in the south-west. Infilled areas can be spotted easily, especially in late spring and early summer, because of the deeper green colour of the rye grass. Blackheath railway station is in the centre, and there are numerous shops, restaurants and pubs. Just south of the railway station is the Blackheath Conservatoire of Music and the Arts. Next door is Blackheath Halls, a concert venue today owned and managed by Trinity Laban Conservatoire of Music and Dance (based in nearby Greenwich). Palladian style, backs directly onto Greenwich Park. Since 2002 it has housed the Wernher Collection of art. ^ a b c Mills, A.D. (11 March 2010). Dictionary of London Place Names. Oxford. ^ By Elizabeth Crawford, ed. The Women's Suffrage Movement: a reference guide, 1866-1928, s.v. "Blackheath"
^ "London Gardens Online". London Gardens Online. Retrieved 15 June 2013. ^ "Vanbrugh Pits on Blackheath". Lewisham.gov.uk. Retrieved 15 June 2013. ^ "Mince Pie House, Vanbrugh Fields, Blackheath, c. 1910 | Lewisham Galleries". Ideal Homes. 29 September 2010. Retrieved 15 June 2013. ^ In 1669, Sir John Morden, 1st Baronet purchased (for £4,200) Wricklemarsh Manor; the mansion and 283 | acre | ha were sold in 1783 by Sir Gregory Page-Turner, 3rd Baronet for £22,000 to John Cator. ^ Howard Colvin, Biographical Dictionary of British Architects, 1600-1840, 3rd ed. 1995, s.v. "Searles, Michael". ^ Homan, Roger (1984). The Victorian Churches of Kent. Chichester: Phillimore & Co. Ltd. pp. 30–31. ^ "Our History: Royal Blackheath Golf Club - The Oldest Golf Club in the world". Royalblackheath.com. Retrieved 29 August 2011. ^ "blackheathcc.com". blackheathcc.com. Retrieved 15 August 2013. ^ "blackheathfencing.org.uk". blackheathfencing.org.uk. Retrieved 15 August 2013. ^ "Common Land and the Commons Act 2006". ^ "Lewisham Council - Local parks - Blackheath". Lewisham.gov.uk. Retrieved 15 June 2013. ^ "Blackheath - Greenwich". Royalgreenwich.gov.uk. 30 April 2012. Retrieved 15 June 2013. ^ "Lewisham Council - Local parks - Ponds on Blackheath". Lewisham.gov.uk. Retrieved 15 June 2013. ^ "Hare and Billet Pond". Nature Conservation Lewisham. 5 October 2012. Retrieved 15 June 2013. 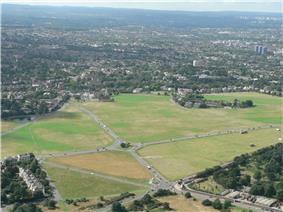 ^ "Lewisham Council - Local Parks - Grasslands on Blackheath". Lewisham.gov.uk. Retrieved 15 June 2013. ^ a b c "Lewisham Council - Local parks - Habitat changes and ecological decline of Blackheath". Lewisham.gov.uk. Retrieved 15 June 2013. ^ "BLACKHEATH: Greenwich Council pulls out of fireworks display". Newsshopper.co.uk. 17 September 2010. Retrieved 29 August 2011. ^ Saturday, 13 September 2014 – Sunday, 14 September 2014, On Blackheath. Retrieved: 24 August 2015. ^ 2015 Headliners, On Blackheath. Retrieved: 24 August 2015. Blackheath is served by several Transport for London bus services linking the area with Greenwich, Lewisham, Charlton, Woolwich, Catford, Eltham, Sidcup, Bexleyheath, Sydenham, Beckenham, Stratford and Westminster. The area is served by Blackheath station with services to London Charing Cross, London Victoria, London Cannon Street, Slade Green via Bexleyheath, Dartford via Bexleyheath and to Gillingham via Woolwich Arsenal. In September 2014, the inaugural On Blackheath festival was hosted on the heath. The line-up included Massive Attack, Frank Turner, Grace Jones, Aloe Blacc and Imelda May. In September 2015, the festival is planned to return, with a line-up including Elbow, Madness, Manic Street Preachers, Laura Mvula and Kelis.